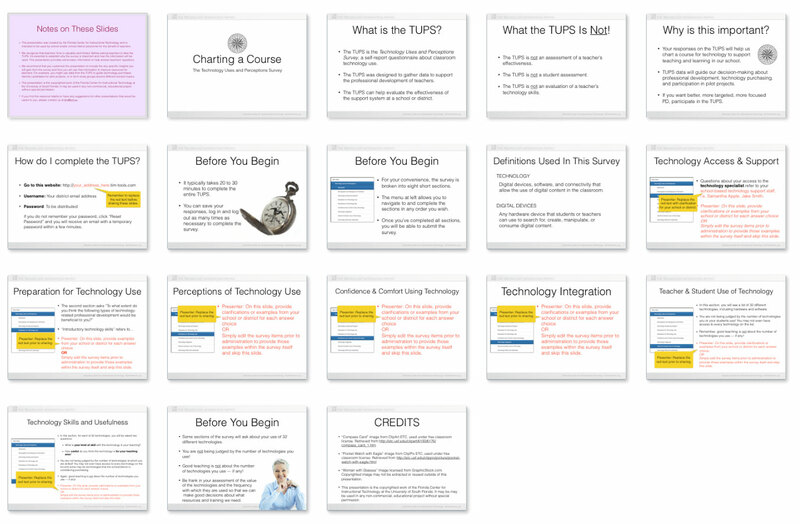 When teachers are asked to complete the Technology Uses and Perceptions Survey (TUPS), they may have questions about the purpose and format of the survey. This brief presentation is meant to answer those questions. The presentation is available as both a Keynote and a PowerPoint, as well as in your choice of standard 4:3 format or wide 16:9 format. The Keynote and PowerPoint versions are zipped for ease of downloading. You will need to unzip these files once you have downloaded them. You can also download a PDF version of the presentation.